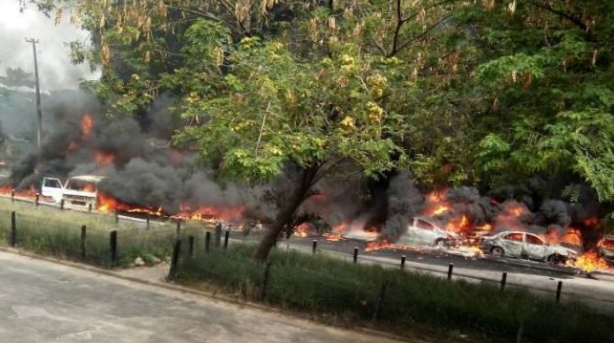 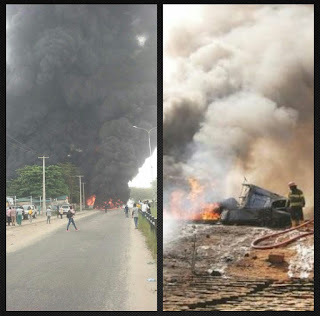 Even with the intervention of firefighters, at least 20 flashy vehicles and four motorcycles were totally burnt on Wednesday afternoon when a tanker loaded with petrol suddenly fell and spilled its substance on the Festac Link Bridge in Awuwo Odofin Local Government Area of Lagos state. The fire started at noon and raged for about an hour. Fire fighters arrived at the scene about 30 minutes later but did not have enough water to quench the fire. A witness, Mr Olufemi Popoola, told newsmen that the tanker, coming from Apple Junction and going to FESTAC Town was ascending the bridge but suddenly rolled back and fell. 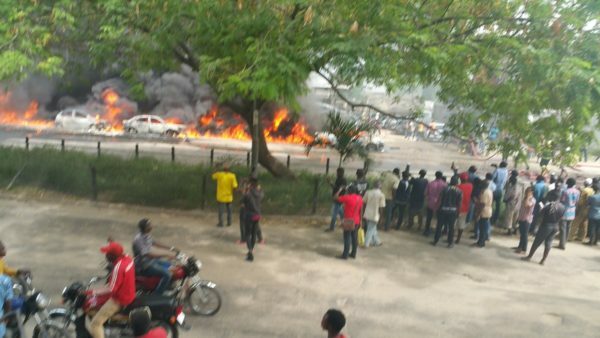 The impact of the fall separated the tank from the body, resulting in an explosion, according to Popoola. 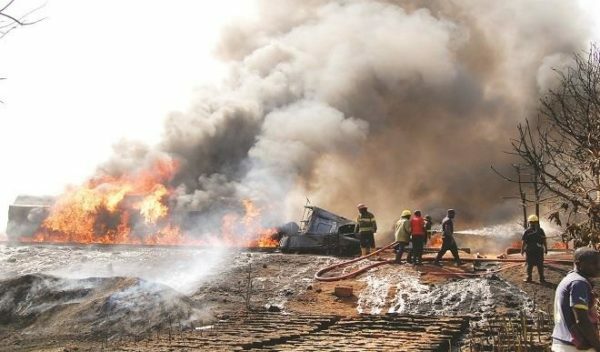 He said that some residents and passers-by attacked the fire with buckets of water to no avail. 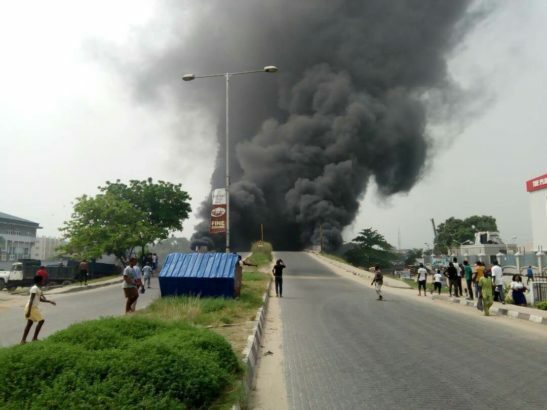 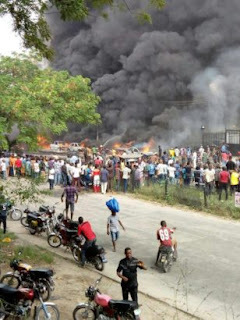 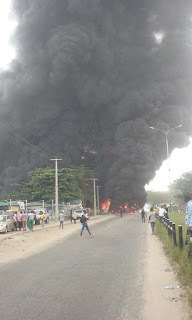 An eyewitness who resides in FESTAC, said that the fire from the tanker spilled over to nearby vehicles, forcing their occupants to run, abandoning them. “The fire then spilled into a car shop on the foot of the bridge, burning some of the cars, while the attendants quickly drove out some. 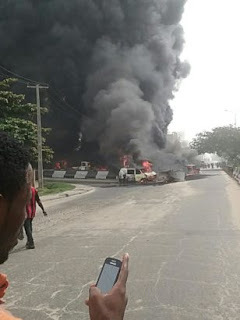 “Furniture items, bags and boxes displayed for sale on the foot of the bridge all burnt,’’ he told newsmen. Newsmen report that the vehicles burnt included a 2010 Toyota Highlander and a commercial bus. 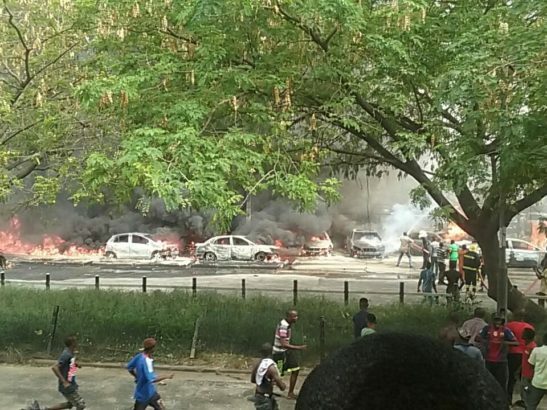 The fire caused gridlock on the bridge and in the adjoining roads. A crowd of affected persons and sympathisers gathered at the scene to lament the situation. One of the owners of the burnt motorcycles, Mr Akuko Okoli, said that he narrowly escaped death.